You may have had that experience of waking up the day after an intense ab workout with aching stomach muscles. The good news is that it may mean you're getting stronger and are on your way to achieving a fetching six-pack. The bad news is that, well, you're feeling discomfort. Stomach cramps after crunches may simply be the result of working out rigorously or working out after a period of little exercise. It could also mean a strain in the abdominal muscles or a consequence of overdoing it. 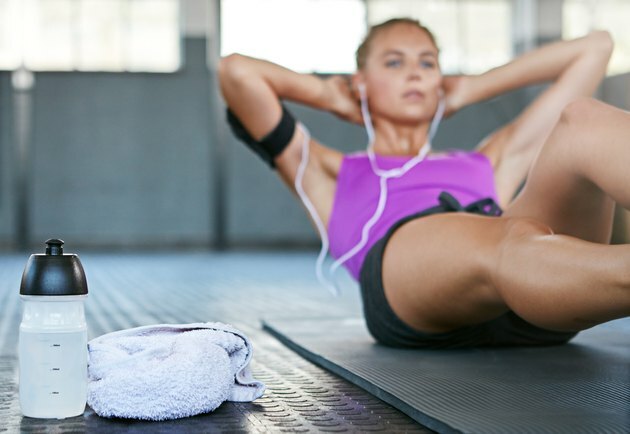 No matter what the reason is, though, it's important to keep in mind ways you can prevent ab cramps after a workout and ways you can relieve the pain. The abdominal muscles play a fundamental role in your day-to-day movements. Sitting, standing, bending over and more wouldn't be possible if it weren't for the muscles in your abdomen. In fact, it's those very muscles that allow movement, support the trunk and hold certain organs in place. It's also important to know that there are four different abdominal muscle groups: transversus abdominis, rectus abdominis, external oblique muscles and internal oblique muscles. The transversus abdominis stabilizes the trunk; the rectus abdominis, when contracting, is what's commonly referred to as the "six-pack"; and the obliques are located on the sides of the rectus abdominis muscles. Abdominal muscle cramps are often caused by a muscle strain, which can result from overuse or overstretching. The cramping may also be the result of delayed-onset muscle soreness (DOMS), which is common after a strenuous workout and should go away on its own within a couple days. If you're experiencing soreness from DOMS, you can speed up the recovery time with gentle exercise, like a walk or swim. If your abdominal muscles are extremely sore after crunches, it may mean you overdid it. Try to ease up on the number of crunches you do per workout. You can prevent a muscle strain by warming up or stretching before exercising. Muscles that are strong and flexible are less likely to get injured. If you're doing ab exercises, it may help to build up your muscle strength, starting with a few crunches and gradually adding on. You can apply a gel pack, ice pack or frozen vegetables wrapped in a cloth to the sore area for 20 minutes. Repeat every three to four hours. If your stomach muscles hurt, you can take nonprescription pain medication, such as acetaminophen or ibuprofen. Summit Medical Group recommends applying moist heat to help relax muscles before a workout. Apply a heating pad 10 to 15 minutes before a workout. Note that you should not apply heat if you're experiencing swelling or inflammation. What Kind of Tea Settles Your Stomach?